Recently, I began searching for the perfect weekend retreat. A quiet place where we can escape the scorching heat of Atlanta summers and our LA size traffic. My list of “must haves” is short, it has to be near a body of water, in the mountains and small. Size is important because if you are going to have a retreat, it’s should only require minimal upkeep right? Over the weekend, I’ll make a two-hour trek back to a charming little European-style cottage (on a lake) before we make an offer. In the meantime, I’ve been drafting a plan of improvements, including gutting the kitchen & bathroom, paint, and moldings. But, most importantly the moldings. The cottage has a small footprint (very) and is in desperate need of a facelift. My goal is to prove you can live large in small spaces. Interior finishes such as baseboards, casings, crown & panel molding will help transform each room. With low ceilings, I can add architectural detail and change the appearance of the interior while making this tiny slice of Georgia heaven feel more unified. 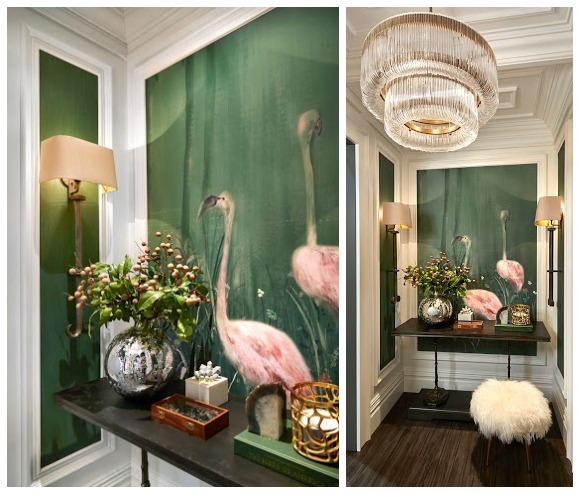 My favorite source for interior finishing products is Metrie, and during our likely renovation project, I’ll be using Metrie’s Then & Now Finishing Collection™. The collection was crafted to fit a wide range of decorating styles, allowing you to give each room in your home it’s own individual personality. 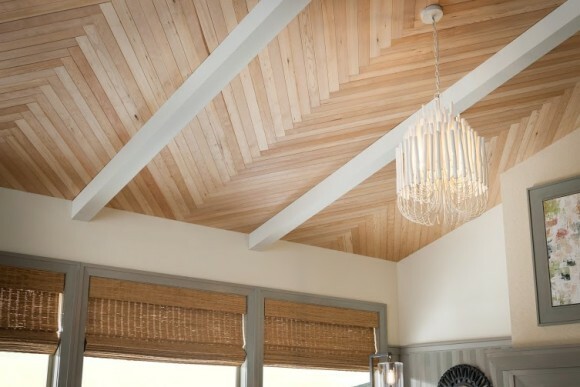 The moldings in our home are more traditional, and if we purchase the lake cottage, I’ll be re-designing the rooms with a “modern cabin” aesthetic using pieces from the True Craft Collection™ letting the fir grain show through a light whitewash for a chic rustic feel. 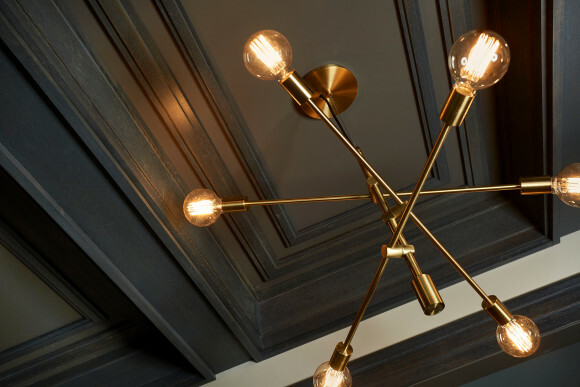 Adding molding and trim to the ceiling brings in interest and drama. The moldings in this picture are from the Metrie’s True Craft Collection. I love the geometric pattern created from molding elements from the Fashion Forward Collection. 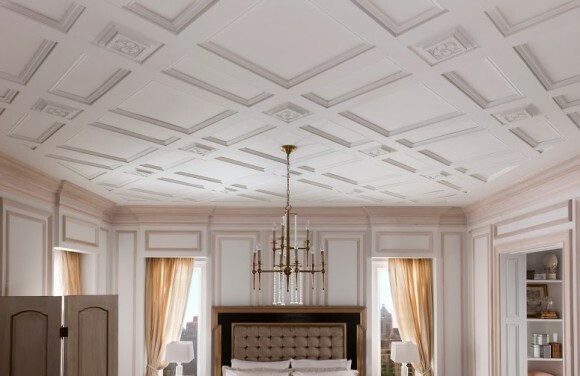 Don’t forget the “fifth wall.” Ceilings are often overlooked, but they have the greatest design potential and adding moldings provides the greatest visual impact. Featured are moldings from the French Curves Collection. Even though the cottage is small, there are so many visual changes I’ll make through the addition of moldings. Eventually, we will replace all the hollow-core doors throughout, but until then I’ll add trim and with a little creativity, the doors will have upscale appeal. The ceilings will have trim elements and crown moldings, and even rooms like the laundry will benefit from a little architectural detail. The doors are from Metrie’s Fashion Forward collection. But, I can still add molding elements to a solid creating a bold statement. It’s areas like the laundry room or foyer that are often overlooked. 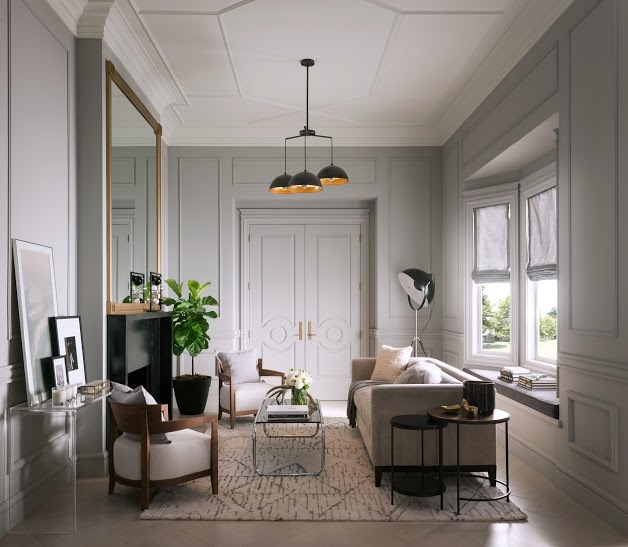 Typically, people reserve moldings and millwork for the main rooms and overlook the power moldings have to make a big statement in small spaces. 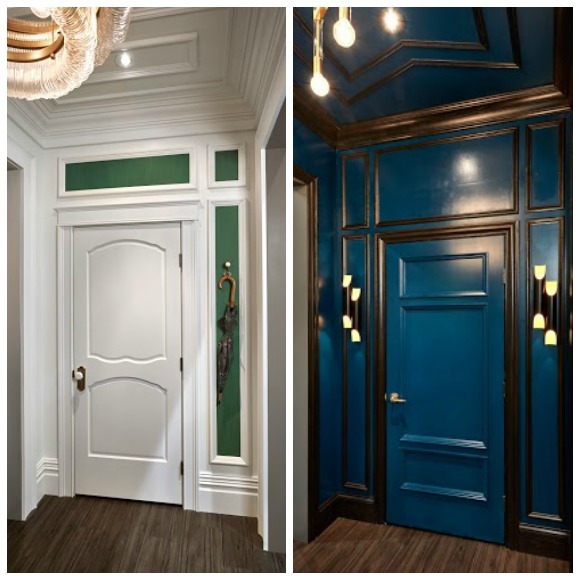 Finishing a room with coordinated trim and interior doors provides balance and drama. My design philosophy has always been that if you take a blank canvas, and begin to add paint and detail (moldings) the room will have interest, and character. It not only improves the look and feel of your home but in many cases adds value. The moldings are from Metrie’s Very Square Collection. 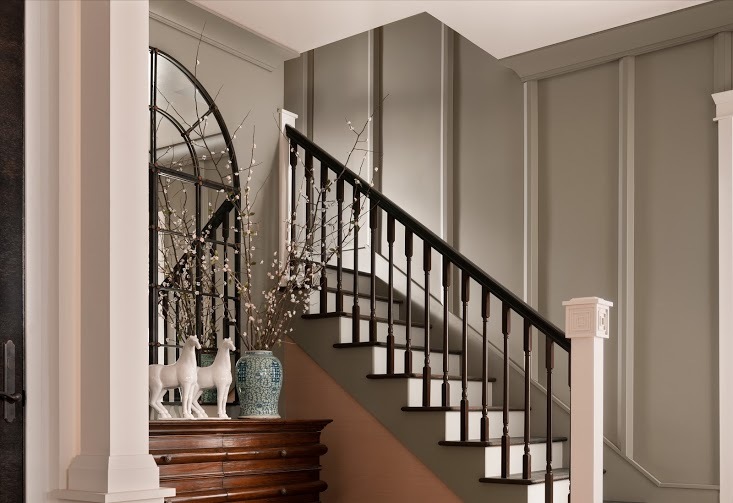 Adding molding to a stairway or foyer makes a space feel finished adding a touch of luxury. The ceiling treatment and addition of floor to ceiling paneling give this bedroom a grand feel. Painted moldings are the perfect way to bring visual impact into a room. If you aren’t sure what moldings and doors are right for your home Metrie has interactive planning tools and resources to guide you through your next home improvement project. Although this post is sponsored by Metrie, all opinions are my own. As always, we will never share a product with our readers that we don’t completely love & adore! Such a good idea. We bought a place that we’re renovating just because it has unbelievable moldings (the building is 17th century but the boiseries and decoration is 18th century, copying Versailles). Our own home, however, is newer and I am itching to work some molding magic. We would love to see the pictures of your renovation, it sounds fabulous! 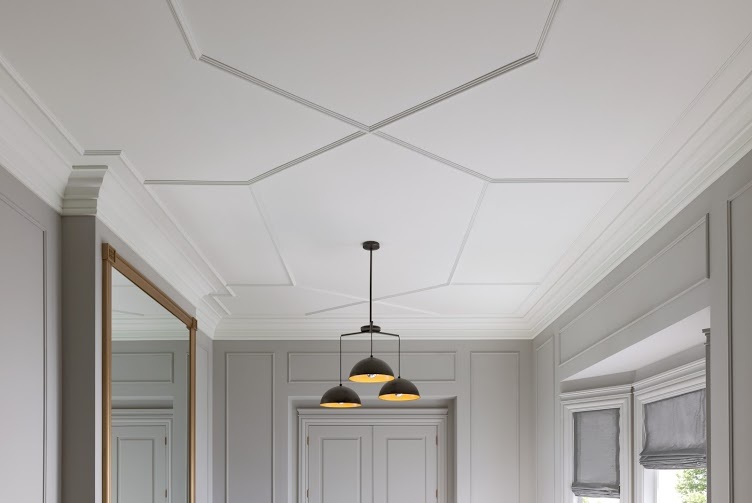 And yes, I agree moldings can create such magic! Beautiful details make such a big difference. Great idea.